Once you have added your drivers and created your groups, you can then start allocating specific drivers to specific groups. Please note a driver can be a member of more than one group and the group “All Drivers” contains a pool of every driver you have added. The image below helps to show how to allocate drivers to groups. 1 – Select “All drivers” so you can choose drivers from your entire driver pool. 3 – Click on the “Group(s)” drop down menu. Then mark the click the tick box appertaining to the groups or groups you would like to that driver to be added to. this will be automatically saved. You can then go through each driver adding them to the correct group. 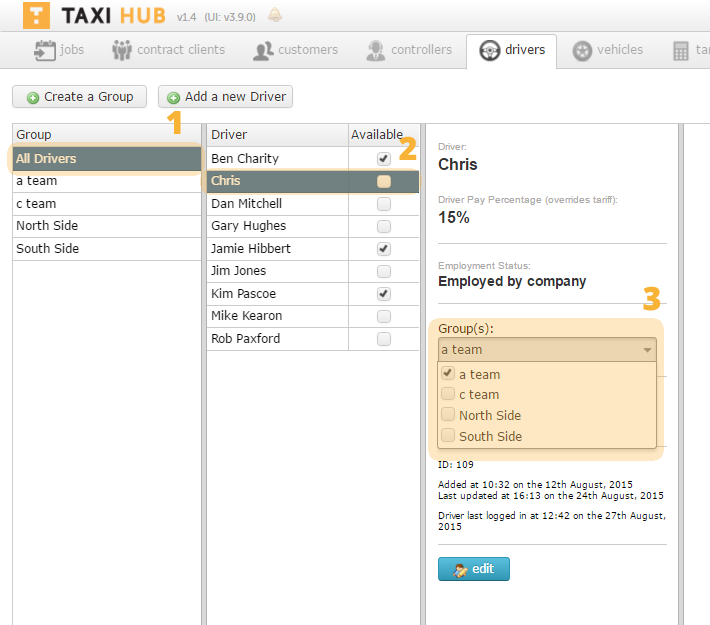 tip – Please remember “Groups” can be selected on the Taxi Hub “planner” to allow for easier management of big fleets.